#1 Seal windows and doors. Everyone hates a draft–especially in the morning. Having carefully sealed windows and doors is imperative to keeping the cold air where it belongs: outside. Before winter weather hits, double-check the seals around your home to ensure they’re not leaking warm air. Also, if you have the time (and budget), look into having your doors and windows re-sealed with weather-stripping. If you’re in search of a quick fix, old blankets or other thick linens placed under doors will work as a temporary solution. Your local home improvement store will also carry a window insulation kit to help stop leaks (if you’re into DIY projects). Checking the drywall and exterior of your home for any holes and re-caulking them is a great way to give your home an additional edge. #2 Check your heating, ventilation, air conditioning (HVAC) system. When was the last time you serviced your HVAC system? Since you don’t want your heating to dip-out during a winter storm, it’s important to make sure your current system is in good shape. Typical HVAC upkeep includes: filter changes, pipe/connection inspections and thermostat tests (especially if you have a smart system). Additionally, if there are issues with the wiring or face of the machine, it’s time to invest in repairs for the thermostat. Unless you have extensive experience repairing HVAC systems, it’s best to leave these repairs up to a professional. Before you build that big holiday fire in the family fireplace, make sure to have it professionally cleaned. (And by “it,” we mean the fireplace and the chimney.) Weather damage, shifting foundations and creosote buildup can lead to some pretty serious problems if ignored. Again, because of the potential cost of a do-it-yourself inspection, it’s highly advised that you have a professional inspect and clean your chimney. #4 Inspect the roof, gutters and downspouts. Before winter weather hits, it’s always a good idea to have your roof inspected by a professional. If any holes, leaks, or missing tiles/shingles are discovered, it’s important to have the problem fixed immediately. Also make sure your roof is properly insulated– a lack of insulation will increase your heating bill if left unchecked. 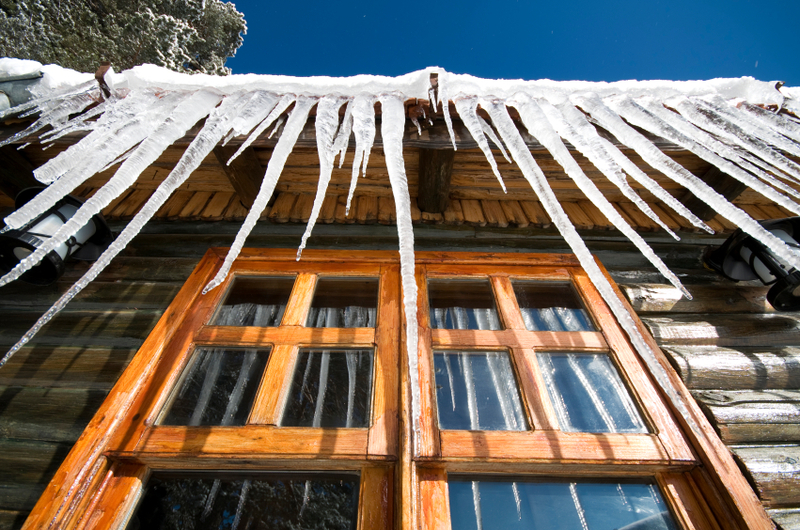 Downspouts and gutters systems also need a thorough check to prepare for snow and ice. Gutters clogged with leaves or dirt prevent moisture from running through your system. Instead, precipitation begins to collect en-masse–causing serious gutter and siding damage. To avoid gutter issues, make sure you have them cleaned before the next winter storm. If you have any exposed pipes, now is the time to insulate them. Use foam, newspapers, or anything insulated (be careful, some pipes become hot and can cause fires if they’re in contact with something flammable) and wrap the pipe using duct tape to secure the covering. Also make sure that any sprinkler systems or pipes leading to a pool are insulated and turned off. Any outdoor faucets should be insulated and covered for the winter as well. To avoid your yard becoming a springtime mud pit, take steps to keep it maintained throughout the winter. This includes: trimming trees/bushes, putting away furniture and planters, as well as periodically shoveling snow and ice away. If you need help getting rid of winter precipitation, you can always hire a snow removal service to help. #7 Put the ceiling fan in reverse. To keep your home warm, another preparatory step is to reverse the circulation of your ceiling fan. Doing so allows the cold air to be pushed to the ceiling, while the warm air is forced back down into the living room. When spring comes around you can always change the circulation back, but utilizing this step gives you more warmth for less money–that’s a win-win. #8 Keep the heater temperature down. Modern heaters are great (no hauling/splitting wood, no severe fire hazards and they actually heat your home), but they don’t have to run constantly to do their job. Try dropping the temperature at night so your heater works less while you’re asleep. This way you can optimize the heater during the day and just use a space heater at night. You can also insulate your heater to help it withstand any potential damage from freezing temperatures.